When the internal storage space is at a premium, download restrictions are bound to happen. That’s the issue with iPhone devices. Since OS doesn’t allow external storage, you ought to make the most out of available space on the device. These constraints are further compounded by the OS taking up 4 GB space and basic apps requiring nearly 4-5 GB of internal space. This limitation poses severe challenges for iPhone app developers like the top mobile app development company Octal Info Solution. They need to trim down the app size to a bare minimum to sustain the competition lingering in this landscape. Hence, lightweight mobile apps become a necessity for the users, and developers need to pull up their socks too. 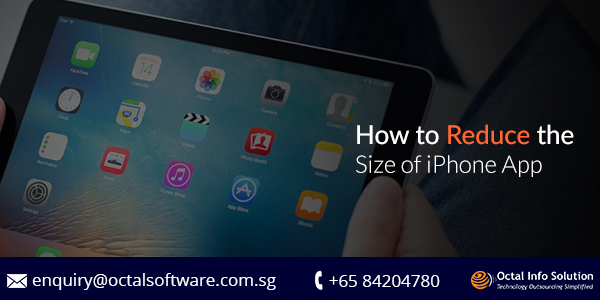 Here are given some simple tips to tone down iOS app size for optimization of spaces on the devices. You can use this method to trim the app size and reduce the weight from the internal storage. It refers to the process of bundling the assets of an app according to the device in use. You can get it done by selecting the targeted devices and creating multiple resolutions for the images that are in use. Subsequently, redundant image versions will be sliced by asset catalog for these target devices. You can also use a simulator tool like XCode to create different versions of the mobile app for target devices. With local testing capability, it helps in releasing a full version of the mobile app to be downloaded by users. It is, in fact, the most popular method of mobile app optimization for iPhone devices. It divides the app codes into smaller fragments. This facilitates users to use only the required app file without downloading the bulk codes. Currently, this feature is applicable to iOS 9 and its advanced upgrades. The complexities of iPhone app development are more now due to the increased usage of multimedia. The mobile apps are designed with different versions for the different architectures but this increases their overall size. With mobile app thinning, these complexities are considerably reduced and only the parts-in-use consume the internal space. As a result, the mobile app gets smaller, faster, and better. Instead of providing the whole bundle of resources, this process allows iOS developer to provide only the resources demanded by the user. This feature is specifically useful for the bulky mobile apps having a truckload of resources. The resources in an app are represented by their respective tags. Throughout the mobile app development process, separate tags are assigned to each resource. As a result, these tags also known as Prefetch tags will be downloaded only when the app is run for the first time on a device. After downloading these initial tags, the conditions of on-demand resources can be applied to other tags. These tags will be downloaded as per the requirements of users and other preset scenarios. There are many benefits of integrating this feature into the mobile app development process. It reduces the app size significantly for optimized performance and download speed of the app. The device utilization is also optimized when resources are downloaded only on demand. Instead of using the internal space for storing the mobile app resources, a remote storage option can be used for saving more space. It refers to the immediate representation of codes for iOS app optimization. As such, mobile app developers needn’t to upload or re-submit the new version of a mobile app to the store. Using the bitcode, the app can be compiled and re-optimized for directly storing in the store. It allows making all required changes in the existing app version. Most importantly, it saves a lot of time as well. Storage, being a consistent challenge for iPhone users, mobile app development companies must streamline the app building process to reduce the app size. These methods collectively can not only reduce the size but also ensure optimized performance and speed of the application. The lightweight apps can help you find a way to the user device. Enriching design, superior performances and intelligent resource management are the cornerstones of a successful iPhone app.